SWLing Post readers might recall the Juno spacecraft we featured in a post dating back to October, 2013. During an Earth flyby, NASA invited ham radio operators around the world to say “HI” to Juno in a coordinated Morse Code message. Juno’s primary goal is to improve our understanding of Jupiter’s formation and evolution. The spacecraft will investigate the planet’s origins, interior structure, deep atmosphere and magnetosphere. Juno’s study of Jupiter will help us to understand the history of our own solar system and provide new insight into how planetary systems form and develop in our galaxy and beyond. Juno will have to withstand Jupiter’s intense radiation and gravity, and–though the craft was designed with this in mind–NASA reminds us that this is very much uncharted territory in space exploration. If you’d like to follow Juno’s progress, I encourage you to bookmark the Juno news page on NASA’s website. This entry was posted in Ham Radio, News, Slightly Off Topic and tagged Juno, NASA Juno, SAY “HI” TO JUNO EVENT on July 1, 2016 by Thomas. 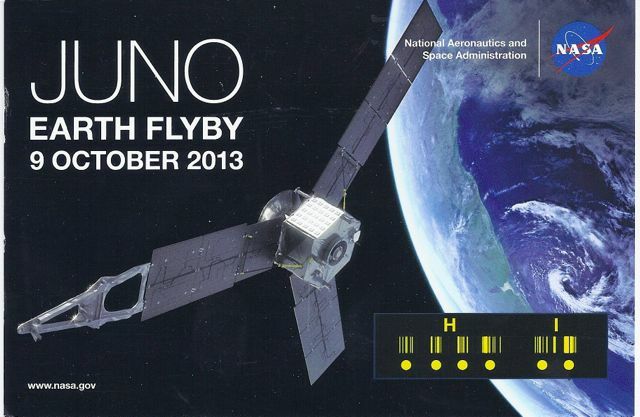 Work the NASA Spacecraft Juno (and get a QSL card)! Many thanks to SWLing Post reader, Troy, who emailed us about a really fun and unique opportunity for amateur radio operators: to send the NASA spacecraft Juno a Morse Code greeting [specifically, “HI”] when it passes over Earth tomorrow, starting around 18:00 UTC. “NASA’s Juno spacecraft will fly past Earth on October 9, 2013, to receive a gravity assist from our planet, putting it on course for Jupiter. To celebrate this event, the Juno mission is inviting amateur radio operators around the world to say “HI” to Juno in a coordinated Morse Code message. Juno’s radio & plasma wave experiment, called Waves, should be able to detect the message if enough people participate. So please join in, and help spread the word to fellow amateur radio enthusiasts! To be clear, this is a coordinated and unified message to the Juno craft; there will be no opportunity to hear a response from it. 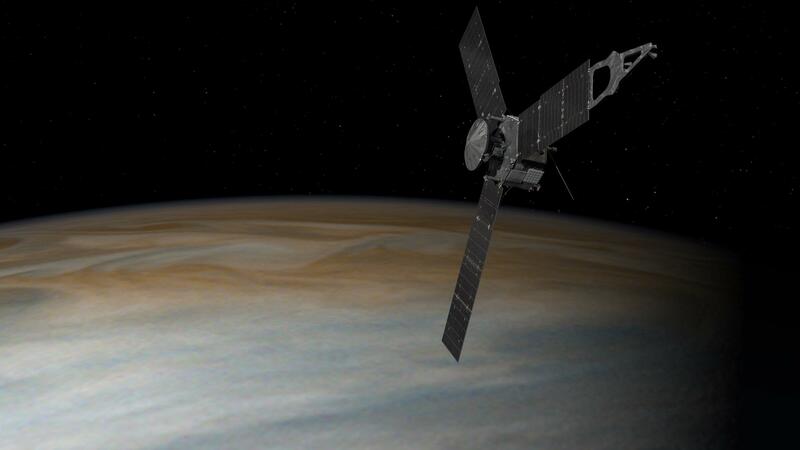 Rather, the Waves instrument data containing the message will be shared by the Juno team after the flyby. But still, what fun! If you’re a licensed ham, and this sounds like something that you’d like to be part of, please check out the the NASA JPL page dedicated to this event. It has all of the information you’ll need to transmit to Juno, including a countdown clock–or to simply listen to everyone who does. Be sure to check out Juno’s Technical FAQ (click on the FAQ link) which answers a lot of the questions participants have already asked. I’ll certainly do my best to be a part of the unified greeting to Juno. I should note that I’m pleased to see the JPL page is running despite the US government shutdown. Many other NASA web pages have been affected. Hi, Juno; we send our greetings! 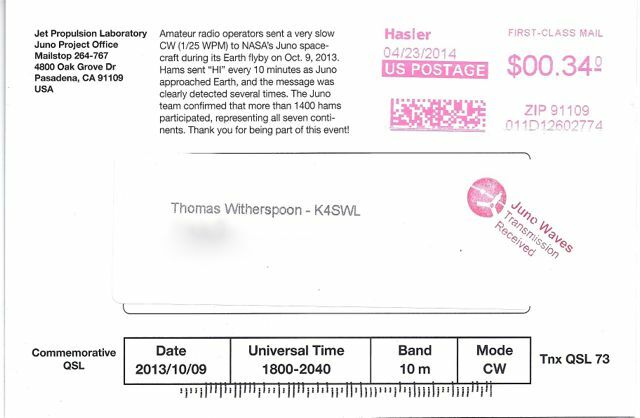 This entry was posted in Ham Radio, News, Shortwave Radio and tagged CW, Juno, Morse Code, NASA, NASA Juno, QSL, SAY “HI” TO JUNO EVENT on October 8, 2013 by Thomas.